This article, written by Martin Sastri, originally appeared in the Fall 2016 Issue of the Beacon. Fair Employment Week is an annual campaign promoted by the Canadian Association of University Teachers. Taking its origins from a state-wide mobilization of instructors at community colleges in California, Fair Employment Week has grown to become an annual week of activism highlighting the unfair working conditions of contract academics (also known, variously, as Part-Time Instructors and Limited Term Appointments), in post-secondary institutions throughout the world. Fair Employment Week takes place in the last week of October. Here at St. FX, the AUT Executive formed an ad-hoc committee to coordinate our local Fair Employment Week activities. This committee consisted of regular faculty members, as well as Part-Time Instructors, and received invaluable support throughout from the AUT’s Executive Assistant, Susan MacKay. The committee began by drafting an open letter to President Kent MacDonald, noting that Part-Time Instructors are an integral part of the student experience at St. FX, and yet these same Instructors are paid minimally and have no real job security. The letter closed by welcoming the opportunity – provided by the pertinent Letter of Understanding in the recently ratified 4th Collective Agreement – to determine with the University Administration how to bring true job security to Part-Time Instructors. This letter was sent to Dr. MacDonald and distributed to the AUT mailing list on Monday, October 24th. On the following Wednesday and Thursday, October 26th to 27th, the committee set up a Fair Employment Week table in the lobby of Nicholson Hall. The table carried a banner, identifying the AUT’s commitment to Fair Employment Week, and both regular faculty and Part-Time Instructors staffed the table, distributed information about Part-Time working conditions at the university, and collected signatures for the national campaign to commit to fair and full employment for all university teachers. The response to the Fair Employment week table was overwhelmingly positive. Students, in particular, made a ready connection between the hardships of teaching Part-Time at St. FX and the economic constraints limiting their own job prospects upon graduation. It was also gratifying for Part-Time Instructors to emerge from the invisibility that hides their working conditions on campus, and to speak in a relatively open manner about inequalities. Speaking from within a common cause, these conversations with students proved to be some of the most rewarding interactions during Fair Employment Week. There were also many positive interactions with regular faculty members, some of whom had previously held non-permanent appointments of one kind or another. One interesting aspect of these encounters was the variety of solutions proposed by faculty members. For example, several faculty members suggested that the lack of progress made relative to Part-Time Instructor concerns is a result of not having a separate bargaining unit specific to Part-Time Instructors. Other faculty members wholeheartedly endorsed the inclusion of Part-Time Instructors within the larger Association, indicating that the last strike was in part intended to improve Part-Time working conditions. Above all, it was clear that fairly and fully employing all teaching staff was not a challenge faculty could conquer in a couple of days. The success of this year’s Fair Employment Week at St. FX was immensely encouraging. Notwithstanding, this should be taken as a mere beginning to more ambitious campaigns and feats of activism. Following the last round of contract negotiations, Part-Time Instructors received a negligible increase in stipend and no improvement with respect to job security. 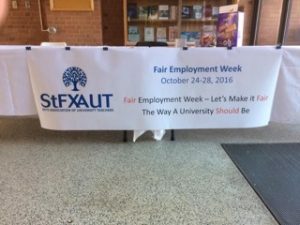 Part-Time Instructors are still the most poorly paid and least secure teaching staff at St. FX, and for these reasons the goals of Fair Employment Week need to be prioritized and publicized throughout the year. This entry was posted in News and tagged activism, ansut, appointment, campaign, caut, collectiveagreement, collectivebargaining, committee, contract, employment, faculty, fair, job, membership, negotiation, precarious, security, solidarity, stfxaut, student. Bookmark the permalink. Trackbacks are closed, but you can post a comment.